Anyone who’s stepped foot in a warehouse can attest to just how much inventory laborers have to move around. In addition, inventory personnel is also responsible for documenting the pick, pack and ship process while on-the-go. But if your inventory management software doesn’t support a mobile app, your staff might not be working as efficiently as they could. Due to the mobile nature of this type of work, it’s beneficial to implement one of the best inventory app systems that can keep pace with you and your workers. 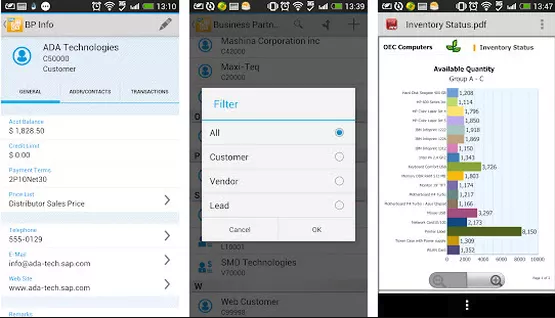 SAP’s inventory solution is fantastic overall and doesn’t disappoint when it comes to its mobile functionality. This vendor offers a mobile inventory app for both iOS and Android platforms. For all devices outside of these two operating systems, SAP also offers a mobile website that can be accessed by any internet-connected device. Additionally, SAP provides nearly end-to-end capability within their mobile app. As you’ll see with some other products below, many vendors focus their mobile resources on tasks directly related to inventory movement, such as barcode inventory software. But SAP allows users to access reports, partner data, travel and leave requests, enterprise search, calendar events, and sales information. This enables warehouse leaders to totally manage their inventory operations from any place at any time. However, SAP Inventory also includes barcode software which enables users to access price and item lists with a quick product scan. Finale is an equally fantastic inventory solution as SAP, tying for the overall first place spot on our Inventory Management Leaderboard. In the Gold plan and above, Finale Inventory offers what they call a “turnkey mobile barcoding solution.” Like the name would imply, this barcode inventory app is easy to implement and doesn’t require a team of software consultants to integrate. Then, once the system is up, all your staff has to do is scan the barcode labels using compatible hardware and all relevant product information is entered into your system. Finale allows users to receive shipments, pick sales orders, transfer stock between warehouses and perform cycle counts. These images demonstrate how a user can access the inventory data collector via scanner. Finale’s mobile solution can utilize either pick and pack methods or wave picking, depending on which best suits your operations. Finale’s barcoding software also supports barcode printing, which is useful when your suppliers haven’t added a label to a particular product. Further, the mobile inventory app syncs data to your main system through either WiFi or a USB cable. TradeGecko, like SAP, allows users to manage nearly all parts of their inventory operations via a native mobile app. However, TradeGecko is only compatible with iOS devices (except when it comes to barcoding, which we’ll discuss shortly). The app lets users manage suppliers, customer data, sales orders, order confirmations and more using real-time information. However, users can also work in the app offline and sync up to the main system when connected to the internet. TradeGecko mobile provides barcoding capability with their recommended scanners. Now, when it comes to barcoding, you’re going to need to purchase compatible scanning and printing hardware. TradeGecko recommends Socket Mobile scanners. These scanners can be used in conjunction with the mobile app for drafting sales and purchase orders, transferring stock, searching products, packing, and cycle counting. TradeGecko’s barcoding app will not assist users with order fulfillment, however. Although Microsoft Dynamics AX will undoubtedly provide inventory capability, this product is more often thought of as an ERP software solution. The mobile app supporting Microsoft Dynamics AX is available on iPhone, Android and Windows phones. Through the app, you can manage aspects of your company beyond inventory such as expense management, timesheets and approvals. Use Microsoft’s barcoding app for a streamlined pick process. Like most other systems on this list, Microsoft’s barcoding app is a separate interface. But the data should still sync to your main system. With the mobile barcode app, users can look up products, facilitate inventory transfer, pick products and document finished production. InFlow is built to help small businesses manage their inventory, and because of this, it offers capabilities that other vendors don’t. For instance, inFlow allows users to scan barcodes directly in the mobile app, using their phones as the scanner. This makes inFlow a great barcode system for small businesses, as cutting out the price of a scanner can help companies reduce costs. However, inFlow also offers their own line of barcode scanners at a far lower price than their competitors if you prefer a dedicated device. See your entire product list on mobile. The inFlow system can be accessed using their mobile inventory application or a web browser. Both Android and iOS devices can be used as a barcode scanner to add and edit products as the app syncs to your larger system. Additionally, users can use the mobile inventory management app to see inventory levels and whether an item is in stock or out. In order to access team and account management features, users will need to open the web browser. Fishbowl Inventory is another great choice for small- to mid-sized businesses looking for intuitive mobile inventory management apps.  This vendor offers a mobile app for use on iOS and Android devices called Fishbowl Go. The system can also be accessed through their mobile website, referred to as Fishbowl Anywhere. Fishbowl Anywhere is basically Fishbowl’s main system in a web browser, whereas Fishbowl Go has more capabilities dedicated to supporting warehouse floor operations and workers. This is an example of Fishbowl’s barcode scanner app. Fishbowl Go works with Android mobile devices, iOS mobile devices and barcoding hardware. With this inventory tracking app, users can quickly scan barcodes to facilitate the pick, pack and ship processes. Additionally, this app can be used to transfer stock, add and remove inventory, perform cycle counts, see part information, fulfill work orders, and document delivery signatures. A third mobile interface, called Fishbowl Mobile, provides similar capability on Windows devices. NetSuite can be accessed on any mobile device with an internet connection and a web browser. Moreover, NetSuite provides a native mobile app for Android and iOS devices, including the Apple Watch. NetSuite’s mobile app for inventory is designed to offer business insights to professionals who can’t be tied down to a desktop at all times. Receive notifications on both your iPhone and Apple Watch. This inventory control app can provide notifications relevant to a number of different roles within the supply chain. For instance, warehouse workers can receive alerts when stock levels fall below a certain point and use the app to order more inventory. Professionals in retail can access insights on how promotions may be affecting stock levels. NetSuite’s mobile inventory management application also allows users to access order status, approve expense reports and see relevant business trends. Through the JDA Mobility platform, users can access all their JDA solutions from either an iOS or Android Mobile device. JDA also provides a mobile website for those using other devices. This vendor emphasizes an intuitive and user-friendly design, similar to those found in consumer applications. JDA’s mobile application enables users to retrieve insights into their inventory, labor, transportation and more on-the-go, facilitating a true omnichannel experience. Users can access JDA on an iPad to see metrics related to spend, performance and value. Further, businesses can create their own mobile solutions based on JDA’s supply chain software solutions and get them certified by the vendor. Called the JDA Certified Mobile Alliance Program, it ensures that mobile apps created by alliance partners will integrate easily with existing JDA products. Although solution customization is common in the enterprise software world, it can often lead to incompatibilities and difficulty when it comes time to perform updates. This program, however, gives businesses more security and peace of mind as they build the mobile solution best suited to their company. Mobile inventory management solutions are invaluable to many businesses. But mobility shouldn’t be the only factor you think about as you shop for a new system. Inventory software can help facilitate order management, shipping, analytics, purchasing and more. It’s important to come up with a list of business requirements to decide exactly what your company needs from an inventory solution. Once you’ve accomplished that, it’s time to compare systems against your criteria. We recommend checking out our inventory management comparison scorecard. It includes all of the best inventory apps we’ve covered here and more, evaluated and ranked by our analyst team. See which systems perform best when it comes to all facets of inventory management. 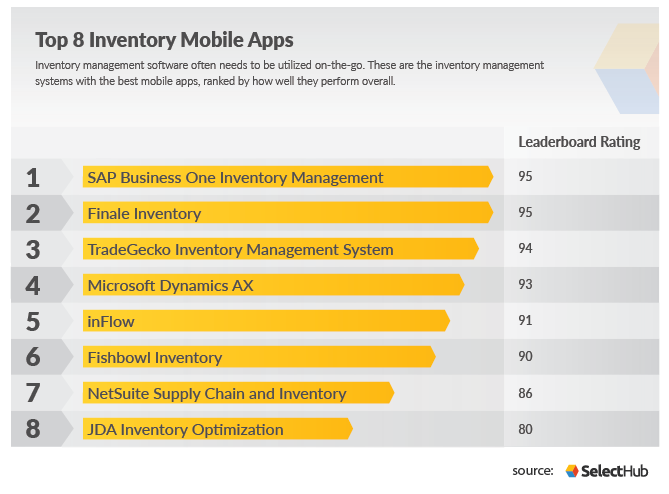 What’s most important to your business when it comes to mobile inventory apps? Is it the barcode program? Or maybe you’re more interested in getting business insights from any location? Let us know by leaving a comment below!